Vincent Tan is no stranger to the limelight, and his latest business venture in America will ensure the spotlight will burn as brightly as ever on Cardiff City's controversial owner. Tan is part of a group of 22 investors who has been awarded the new Major League Soccer franchise, Los Angeles Football Club. With basketball legend Magic Johnson one of this party, it is no ordinary consortium. It is a vibrant and varied collection of illustrious business people, former athletes and entrepreneurs. And they all share a common goal of wanting to make vast profits from a booming sport. Football is growing rapidly in the United States, with millions watching the Premier League on television and the MLS aiming to compete with Europe's elite in the near future. The expansion of the MLS to 22 franchises is proof of the domestic game's development, while in August, 109,000 fans watched Manchester United and Real Madrid play in Michigan. This emerging market already boasts a number of prominent names. Arsenal's majority shareholder Stan Kroenke owns the Colorado Rapids, while former boxing world champion and founder of Golden Boy Promotions, Oscar De La Hoya, is a co-owner of Houston Dynamo. Former England captain David Beckham, who played for Los Angeles Galaxy, has also entered the fray and has set some lofty ambitions for his new franchise in Miami. "The MLS is possibly the most lucrative franchise around," says football finance expert Professor Tom Cannon. "We're looking at some very big players coming into the sport and some very preferential television deals, which put funds directly in the hands of the franchise owners in ways that are not normal in Premier League football. "The black line is an awful lot more favourable. It's got the growth rate, which is remarkable, but you don't have the accumulated debts which are all too common in the Premier League." While football's rise shows no sign of slowing in the US, the American influence on the European game is increasingly pronounced. Manchester United, Liverpool, Arsenal, Aston Villa and Sunderland are all currently under American ownership. Swansea City have also opened discussions with American millionaire John Moores over potential investment in the club. With Tan in charge, Swans' arch rivals Cardiff have been under foreign ownership for four years. The Malaysian has said he remains committed to Cardiff, while he also plans to invest in another unnamed European club. But for the moment, Tan's primary concern is his first foray into the MLS. The LAFC ownership group of 22 includes a number of familiar faces. 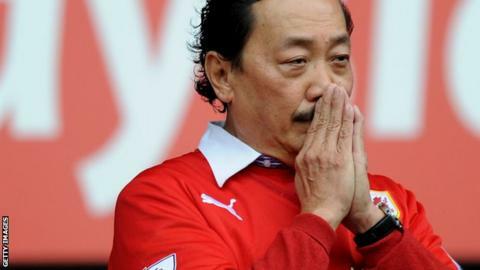 Malaysian businessman Tan bought Cardiff in 2010 and his investment helped them win promotion to the Premier League, but his decision to change the club's colours from blue to red was controversial. Tan also owns FK Sarajevo in Bosnia-Hercegovina. Johnson became a household name as a point guard for the Los Angeles Lakers and the United States' famous 'Dream Team' which won a gold medal at the 1992 Olympics. Johnson, voted one of the 50 greatest players in the National Basketball Association's history, is also one of the owners of baseball team the Los Angeles Dodgers. Hamm was named Fifa women's player of the year in 2001 and 2002 and scored 158 goals in 275 appearances for the United States. She is married to former Major League Baseball player Nomar Garciaparra, who is also part of the LAFC ownership group. The ownership group is led by entrepreneur Henry Nguyen, businessman Peter Guber, and sports television analyst Tom Penn. Other notable names include Queens Park Rangers co-owner Ruben Gnanalingham, Roma co-owners Larry Berg and Bennett Rosenthal and YouTube co-founder Chad Hurley. The remaining members are Tony Robbins, Allen Shapiro, Rick Welts, Kirk Lacob, Mark Leschly, Mike Mahan, Irwin Raij, Paul Schaeffer, Brandon Schneider, Jason Sugarman and Harry Tsao. According to the MLS website, "additional prominent owners" are expected to be added to the list, while the LAFC coaching staff will be announced at a later date.